Product prices and availability are accurate as of 2019-04-25 14:36:26 EDT and are subject to change. Any price and availability information displayed on http://www.amazon.com/ at the time of purchase will apply to the purchase of this product. Seventh Generation Baby Wipes are moistened with natural Aloe Vera, Vitamin E, and water to cleanse gently and naturally. 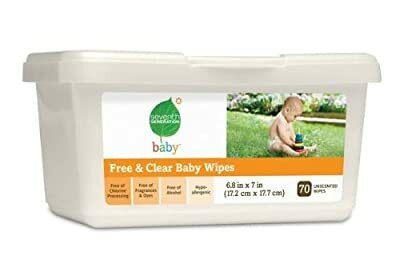 Unlike many traditional baby wipes, ours are fragrance free, not bleached with chemicals containing chlorine and do not contain alcohol or synthetic ingredients that can irritate baby's skin.